A convivial meeting for drinking, music, and intellectual discussion among the ancient Greeks; now, a meeting or conference for the discussion of a topic or special subject. A participant in a symposium (a formal meeting held for the discussion of a subject, during which individual speakers may make presentations). 1. A conference or meeting where academics or experts have discourses about certain subjects: At the symposium, professionals delivered speeches about topics in their special fields of knowledge. 2. A social get-together of people where they can talk freely about their ideas: Once a month Jerry took part in a symposium where he met his friends and had conversations about intellectual topics. 3. A jovial and merry party with light talk and music: For her birthday, Rebeca wanted a symposium for her twenty-fifth celebration. 4. 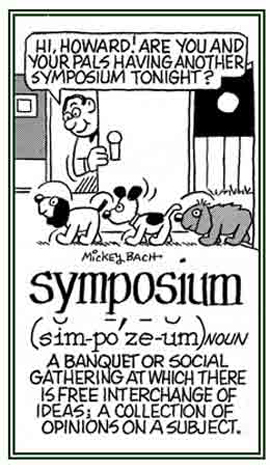 Etymology: from Greek sumposion, "a drinking party" from Latin symposium; from syn, "together" + posis, "a drinking." © ALL rights are reserved.